As technology continues to improve and get smarter, manufacturing facilities are better able to oversee their equipment’s performance and keep track of scheduled maintenance through remote monitoring. Remote monitoring uses machine sensors to collect important data, such as pressure, temperature, energy consumption, loaded hours and unloaded hours. The information is then sent from the controller to the user’s dashboard so plant managers have insight into machine production. Users can use the dashboard to access detailed information, data trends and maintenance schedules in order to identify any issues affecting normal operations. With remote monitoring, employees no longer need to constantly be on the plant floor recording tedious data points. The system can easily collect and send this information to the user dashboard so employees can spend more time analyzing the data for increased efficiencies. If problems arise, the remote monitoring system is able to send alerts and notifications via email and SMS so users can quickly address the issue and minimize downtime. The system can also be programmed to send notifications when scheduled maintenance is due and request quotes for these services. Remote monitoring software can take machine data and produce graphs for a better visualization of how production changes week over week, month over month or year over year. This can inform trends and provide useful insight into whether or not machines are operating efficiently. Remote monitoring gives users access to important data for better informed decision making. Employees no longer need to monitor all equipment at all working hours of the day, saving plants on labor costs and expensive equipment failure. 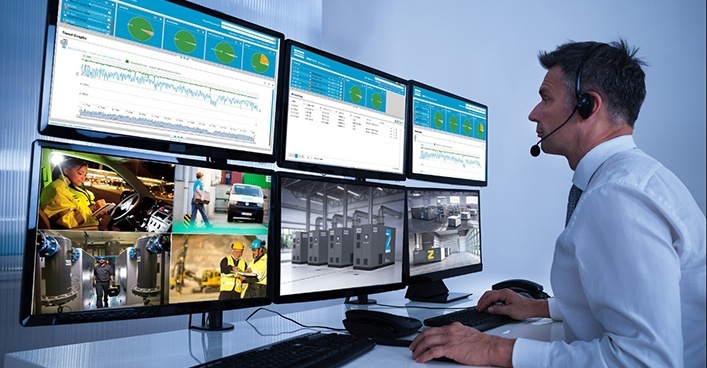 For more information on the benefits of remote monitoring, please reach out to an Atlas Copco expert.